Linking the worlds of community development, higher education administration, and urban design, this accessible guidebook offers useful information on how universities and communities can best develop partnership projects. Its focus on smart growth projects further enhances its value for those interested in how urban, suburban, and rural growth can be accommodated while preserving open spaces and quality of life. 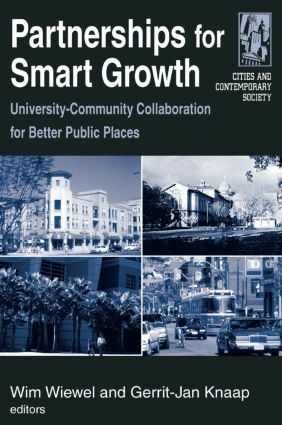 Partnerships for Smart Growth includes 13 case studies for university-community collaborations on smart growth initiatives. The chapters include geographically diverse locations and urban, suburban, and rural projects. Each case includes a comprehensive discussion of how and why the project was initiated, who was involved, what techniques were employed, what were the pitfalls, and what was the outcome. The result is a book with wide appeal for university administrators, land-use planners and administrators, scholars, and community development experts.